Let’s all say it once more, loud and clear: “Marco Polo did NOT bring pasta to Italy from China!” Dried pasta was already eaten in Europe before the good man returned from his travels in 1295. According to some, pasta was already known to the ancient Romans. But Roman lagana and tracta can not simply be compared to the later pasta. In their edition of De re coquinaria from 2006 (see bibliography) Grocock and Grainger suggest that lagana had more resemblance to a Mexican tortilla or Indian chapatti than Italian lasagna (Grocock/Grainger, p. 349/50). According to Capatti and Montanari (Italian cuisine, see bibliography), dried pasta was invented by Arabs in the ninth century to take with them on their travels through the desert. In the twelfth century there was a complete industry in dried pasta in Sicily, which has been under Arabian rule for centuries. Merchants from Genoa traded dried pasta to the Italian peninsula, and soon it was also produced there. (Italian cuisine, pp. 51/52). On this page are two recipes, one for pasta dough with eggs, and another without eggs that is especially for stuffed pasta. 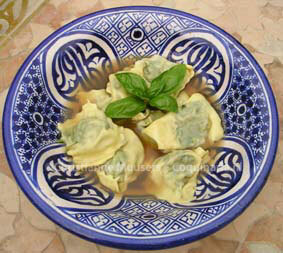 The first recipe is incorporated in a recipe for tortelletti with capon flesh. Just the ingredients are named, apparently everyone knew by experience how much of everything was needed. On top of this page is a detail from an illustration from the Opera from Scappi, with a rolled-out sheet of pasta dough. One can wonder whether the cook is merrily waving, or has just burned his hand. The recipes are from the cookery book Opera (first published 1570) from Bartolomeo Scappi, who was active from 1536 to 1570. More about this famous renaissance cook can be read in the introduction to the recipe for tortelli in brodo. On this page is described how Scappi made macaroni, using some very special ingredients. The picture is from the Tacuinum Sanitatis (about 1400 AD). 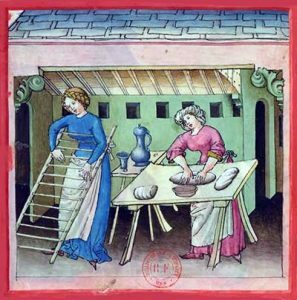 One woman is kneading pasta dough, another woman is holding a rack for spreading the cut and stretched pasta to dry. Other versions of this miniature show the pasta already on the rack. Maybe the painter has forgotten to paint them in. I think the modern way of drying pasta, rolled loosely as bird’s nests, is more practical, because you’ll need a very deep pan to boil this long pasta! Below are a recipe for pasta dough for stuffed pasta (in Scully’s edition p.230, part of recipe II.177), and a recipe for pasta with eggs, to make tagliatelle and lasagne (Scully p.228, recipe II.173). The Italian text is from the facsimile edition of the Opera mentioned in the bibliography, the English translation is from Scully’s 2008 edition (see bibliography). When I tried to translate this text myself (before 2008), I had trouble with one passage: fettaccisi fuora per lo criuello il farinaccio. A kind Italian neighbour of my father’s helped me, and I see in Scully’s version that my Dutch translation was correct. Ann Willan has left this passage altogether out of her version of the recipe (Great Cooks and their Recipes p.46). Impastinosi due libre di fior di farina con tre uoua, & acqua tepida, & mescolisi bene sopra una tavola per lo spatio d’un quarto d’hora, & dapoi stendasi sottilmente con il bastone, & lascisi alquanto risciugare il sfoglio, & rimondinosi con lo sperone le parti piu grosse, che son gli orlicci, & quando sarà asciutto però non troppo, perche crepe rebbe, spoluerizzisi di fior di farina con il fetaccio, accioche non si attacchi, piglisi poi il bastone della pasta, & comincisi da un capo, & riuolgasi tutto lo sfoglio sopra il bastone leggiermente, cauisi il bastone, e taglisi lo sfoglio cosi riuolto per lo trauerso con un coltello largo sottile, e tagliati che saranno, slarghinosi, & lassinosi alquanto rasciugare, & asciutti che saranno, fettaccisi fuora per lo criuello il farinaccio, & facciasene minestra con brodo grasso di carne, o con latte, & butiro, & cotti che saranno, seruanosi caldi con cascio, zuccaro, & cannella, & uolendone far lasagne taglisi la pasta sul bastone per lungo, & compartasi la detta pasta in due parti parimente per lungo, e taglisi in quadretti, & faccianosi cuocere in brodo di lepre, ouero di grua, o d’altra carna, o latte, & seruanosi calde con cascio, zuccaro, & cannella. Work two pounds of flour, three eggs and warm water into a dough, kneading it on a table for a quarter of an hour. Roll it out hin with a pin and let the sheet of dough dry a little. With a cutting wheel trim away the irregular parts, the fringes. When it has dried, though not too much because it would break up, sprinkle it with flour through the sifter so it will not stick. Then take the rolling pin and, beginning at one end, wrap the whole sheet loosely onto the pin, draw the pin out and cut the rolled-up dough crosswise with a broad, thin knife. When they are cut, broaden them. Let them dry out a little and, when yhey are dry, filter off the excess flour through a sieve. Make up a soup of them with a fat meat broth, or milk and butter. When they are cooked, serve them hot with cheese, sugar and cinnamon. If you want to make lasagne of them, cut the dough legthwise on the pin, and and likewise divide it lengthwise in two, and cut that into little squares. Cook them in the broth of a hare, a crane or some other meat, or in milk. Serve them hot with cheese, sugar and cinnamon. For 4 persons (more or less). A tip: if the pasta dough remains too dry (crumbly) add a little water (one teaspoon at the time). Is the dough too wet (sticky), add some flour. For mixing and kneading dough, see the page on making fresh pasta. Also on that page: how to roll out and cut your pasta. The dough from this recipe can be used to make Tortellini in brodo. For mixing and kneading dough, see the page on making fresh pasta. Also on that page: how to roll out and cut your pasta. The oldfashioned way is to roll out the dough with something like a broomstick. Then sprinkle the sheet of dough with flour (to prevent the dough sticking together) and wrap it loosely around the same stick. Pull out the stick, and, using a thin, sharp knife, cut the roll into strips. Depending on how wide these strips are, you’ve made tagliatelle or papardelle. You can also cut the sheet into smaller pieces, making lasagne. The pasta must be dried and the surplus of flour shaken off in a sieve before boiling. The pasta is boiled right before serving the dish. Scappi gives us no clue as to how much broth the tagliatelle are to be served in, or if the pasta is drained before serving. The word minestra in the recpe title means ‘thick soup’, so at least a little broth is to be expected. So, the pasta has to be cooked in broth. Although I do not like using stock cubes, in this case I do, because the cooking-broth will become turbid. If you want to serve the pasta in a clear broth, it best to use a separate, concentrated home made stock. According to Scappi you can also cook pasta in milk. This is still done in modern Italian cuisine, especially in minestre with rice. Scappi also describes how to make macaroni: hollow pasta pipes. That has also been translated and adapted on Coquinaria, see the historical recipe Per far minestra di maccaroni a ferro. See for later developments on this page. This is indeed water that is perfumed with rose petals. In the modern Western cuisine its use is obsolete (except in e.g. marzipan), but during the Middle Ages and Renaissance it was a popular condiment (as was orange blossom water). In the Middle-East and India rose water is still in use. Alberto Capatti and Massimo Montanari, Italian Cuisine: A Cultural History (Arts and Traditions of the Table: Perspectives on Culinary History) 2003 (translated from Italian La cucina Italiana. Storia di una cultura,1999). L.C. Arano, Medieval Health Handbook: Tacuinum Sanitatis. George Braziller, 1976. Anne Willan, Great Cooks and Their Recipes: From Taillevent to Escoffier (Bulfinch Press 1992). T. Scully, The Opera of Bartolomeo Scappi (1570): L’Arte Et Prudenza D’Un Maestro Cuoco/The Art and Craft of a Master Cook (Lorenzo Da Ponte Italian Library) . English translation, without original Italian text. University of Toronto press, 2008. Link to the original Italian text (facsimile). Historical recipes for fresh tagliatelle, lasagne and ravioli from the cookbook of Bartolomeo Scappi (1570). Pasta with a twist.